RALEIGH, N.C. -- Markell Johnson had career highs of 27 points and five 3-pointers to help North Carolina State beat No. 7 Auburn 78-71 on Wednesday night. Devon Daniels scored all 15 of his points after halftime for the Wolfpack (10-1), who led nearly all night before pushing ahead for good in the final 10 minutes. N.C. State shot 58 percent after halftime behind Johnson and Daniels. Johnson stood out with 19 points after the break, including a run of 10 straight points - a 3-pointer, a four-point play and pull-up 3 in transition - during one critical 75-second sequence. "I want Markell Johnson to stay aggressive," N.C. State coach Kevin Keatts said. "I think he has the ability to be one of the best guards in the nation when he stays aggressive. For me, that is on both ends of the floor." 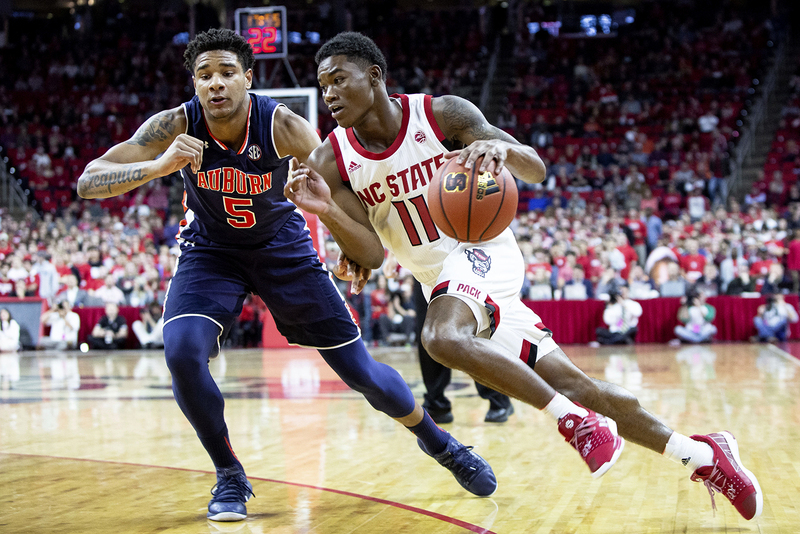 By the time Daniels scored twice followed by Johnson's layup, the Wolfpack had pushed the lead to a dozen near the four-minute mark on the way to another big win under Keatts. 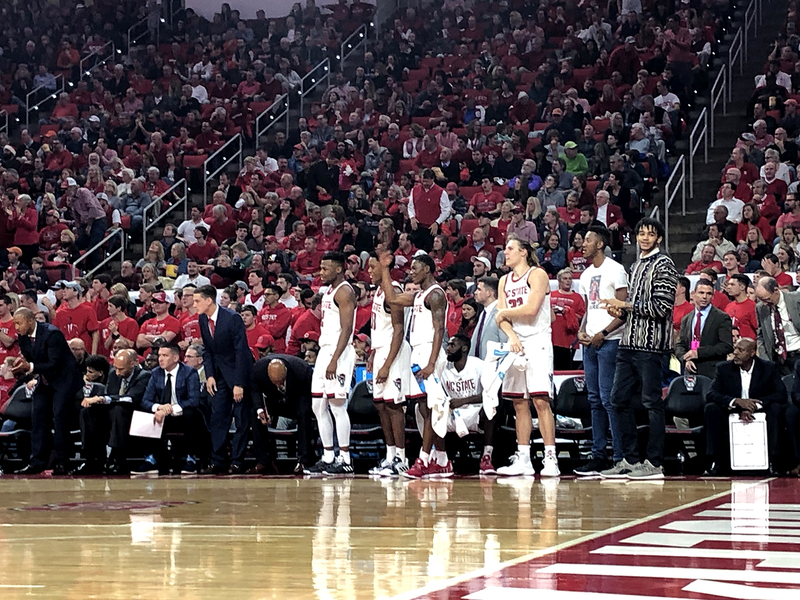 "This was probably the most pressure I have ever had going into a game," Keatts said. "When they hand out 1,000 shirts that say "Kevin Keatts is a Winner" you better win that game or those shirts aren't going to be good." N.C. State's Markell Johnson drives against Auburn's Chuma Okeke. Johnson finished with a career-high 27 points. Auburn's only other loss was also to an ACC opponent, Duke. The Blue Devils beat the Tigers 78-72 on Nov. 20. N.C. State got a big win against a Top 10 opponent Wednesday, forcing Auburn into 25 turnovers. J'Von McCormick scored 14 points for the Tigers (9-2), who shot 48 percent but committed a season-high 25 turnovers. N.C. State: It was a good measuring-stick win. The Wolfpack's only loss had come in a close game at No. 16 Wisconsin. "I'm excited," Keatts said. "We didn't accidentally become 10-1. Our guys have worked extremely hard to get there. Hopefully, we're going to continue to get better and stay hungry and stay humble. I'm excited. "I've said this before," he added, "if the Wisconsin game was a learning opportunity for us, I'll take that loss any time if we're going to continue to get better from it." N.C. State had beaten power-conference opponents Penn State and Vanderbilt in what has otherwise been one of the nation's softest nonconference schedules. That left plenty of question about exactly how good this group is (or isn't). Wednesday's answer proved to be the former, with Johnson beating Tigers defenders all night and Daniels turning in a huge second-half performance. "It was good. There was a lot of energy in the crowd, and the fans were great," Daniels said. "It felt really good to just come out of here with a win." Auburn: The Tigers just made too many mistakes. Auburn started cold to get in an early hole, then warmed up only to repeatedly commit turnovers that frittered away any momentum they put together. And finally, the defense that came in ranked 19th nationally in KenPom's adjusted efficiency never found a way to slow Johnson's roll, nor Daniels after halftime. "I think that drives our team," Johnson said, of defensive pressure. "When we can get a live ball turnover, get down the court, run in transition, get open shots, and get to the basket, I think that helps us a lot." N.C. State: USC Upstate visits the Wolfpack on Saturday. Auburn: The Tigers host Murray State on Saturday.